Histochem Cell Biol, 2015, 10.1007/s00418-015-1352-0. ICG-001 purchased from Selleck. ICG-001 variably influences Wnt transcriptional activity across pancreatic cancer lines. Nuclear extracts from AsPC-1 cells treated with vehicle or 30 umol/L ICG-001 for 6 hours were immunoprecipitated with anti-CBP or control IgG antibodies followed by Western blot analyses for β-catenin and CBP. 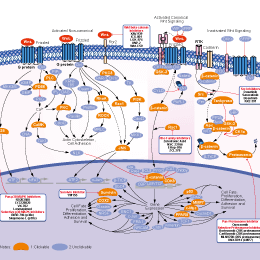 Mol Cancer Ther 2014 13(10), 2303-14. ICG-001 purchased from Selleck. The fully differentiated 3T3L1 cells were collected. mRNA and protein levels of FAS and CD36 were measured. Dose effect of IWR-1-endo, PRI-724, and ICG-001 on FAS and CD36 protein levels measured by immunoblots and the figures show quantification of the immunoblots. Biochim Biophys Acta, 2018, 1863(8):834-843. ICG-001 purchased from Selleck. Marker protein of fibroblast-to-myofibroblast transition vimentin, a-SMA and collagen I overexpression in HELF cells caused by TGF-b1 for 24 hrs. J Cell Mol Med, 2017, 21(8):1545-1554. ICG-001 purchased from Selleck. J Biol Chem 2013 56(4), 423-33. ICG-001 purchased from Selleck. Coimmunoprecipitation analysis of HCT-116 and SW620 cells treated with ICG-001. (A) Coimmunoprecipitation of HCT-116 CRC cells, using 75 uM ICG-001. 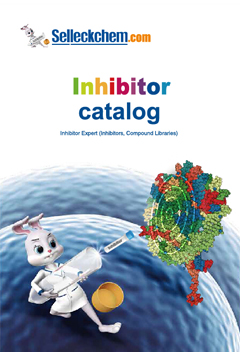 Anti-CBP or anti-p300 antibody was used for the immunoprecipitation and beta-catenin was detected with an anti-beta-catenin antibody after SDS-PAGE. (B) Coimmunoprecipitation assay, similar to that described in (A), showing activity of 100 uM ICG-001 against CBP-beta-catenin association in SW620 CRC cells. J Cancer 2013 4(6), 481-90. ICG-001 purchased from Selleck. Mol Immunol 2013 56(4), 423-33. ICG-001 purchased from Selleck. The Dual-Luciferase Reporter (DLR) Assay System provides an efficient means of performing dual reporter assays. In the DLRTM Assay, the activities of firefly (Photinus pyralis) and Renilla (Renilla reniformis, also known as sea pansy) luciferases are measured sequentially from a single sample. The firefly luciferase reporter is measured first by adding Luciferase Assay Reagent II (LAR II) to generate a “glow-type” luminescent signal. After quantifying the firefly luminescence, this reaction is quenched, and the Renilla luciferase reaction is initiated by simultaneously adding Stop & Glo® Reagent to the same tube. The Stop & Glo® Reagent also produces a “glow-type” signal from the Renilla luciferase, which decays slowly over the course of the measurement. In the DLRTM Assay System, both reporters yield linear assays with subattomole (<10-18) sensitivities and no endogenous activity of either reporter in the experimental host cells. Furthermore, the integrated format of the DLRTM Assay provides rapid quantitation of both reporters either in transfected cells or in cell-free transcription/translation reactions. Formulation: Water-soluble analog of ICG-001 is used. Administration: Water-soluble analog of ICG-001 is treated orally for 9 weeks everyday. Emami KH, et al, Proc Natl Acad Sci USA, 2004, 101(34), 12682-12687. Teo JL, et al, Proc Natl Acad Sci USA, 2005, 102(34), 12171-12176. Yan D, et al, J Biol Chem, 2012, 287(11), 8598-8612. Henderson WR Jr, et al, Proc Natl Acad Sci USA, 2010, 107(32), 14309-14314. If the compound is stored in DMSO at -80, how long would it be stable? For cell culture, how long should I change for the fresh medium with ICG-001? The product in DMSO solution can be stored at 4 degree for 1 week and -20 degree for 1 month. The best storage condition is solid powder, even at -80 the solution is not stable enough for long term storage. For cell culture, you need change medium every 48h. Features:May act downstream of APC and GSK3β in the canonical WNT signaling pathway.